Warwick Davis was only 11 when he was selected out of a 1981 casting cattle call to play Wicket the Ewok in Return Of The Jedi. Since then, the 3' 6" actor has taken on dozens of memorable film and stage roles, though he's often unrecognizable inside a costume or under heavy makeup. Davis returned as Wicket in two ABC television movies, played Reepicheep the mouse and Glimfeather the owl in BBC adaptations of C.S. Lewis' Narnia books, made several appearances in Star Wars: Episode I—The Phantom Menace, and will play Professor Flitwick in the upcoming Harry Potter And The Sorcerer's Stone. He's starred in nearly a dozen theatrical productions in his native England, including nine successive stagings of Snow White And The Seven Dwarves, two of which he directed. And in 1995, he and his father-in-law founded Willow Personal Management, a talent agency for actors and actresses under five feet tall. But he's best known for two things: his recurring starring role in the Leprechaun horror series (which hit its fifth installment with last year's Leprechaun In The Hood) and his titular role in the 1988 fantasy movie Willow. Davis recently spoke to The Onion A.V. Club about Willow, acting from inside and outside bulky costumes, and the future of short actors in a CGI world. The Onion: Is it true that Willow was written specifically with you in mind? 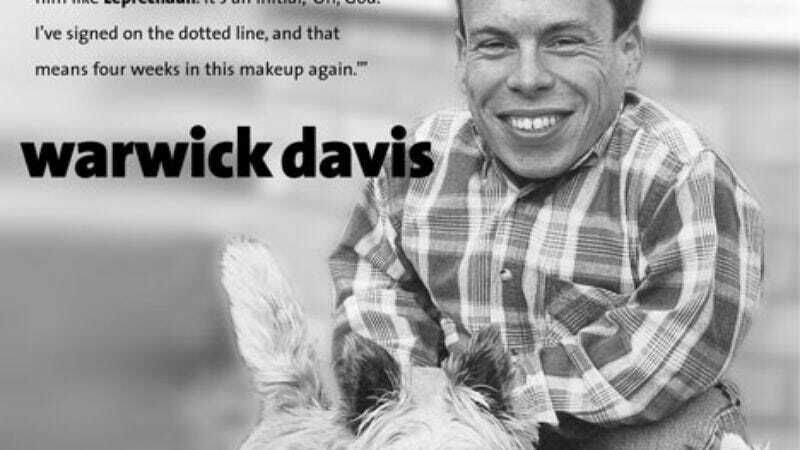 Warwick Davis: Yes. It was originally mentioned to my mum, actually, while we were filming one of the Ewok movies for ABC television back in 1983. George [Lucas] just simply said that he had this idea, and he was writing this story, with me in mind. He didn't say at that time that it was going to be called Willow. He said, "It's not for quite yet; it's for a few years ahead, when Warwick is a bit older." And it turned out to be Willow. O: But you had to audition for the role, even though it had been written for you? WD: Yeah. I mean, I was asked, in 1986, and they called me in… Ron Howard and George Lucas wanted to see me at Elstree Studios in London, which is where they shot all the Star Wars and Indiana Jones movies. And at the meeting, they told me about the film, and that was that. George had always wanted me to play the role, but Ron wanted to sort of assert himself in his role as director, and audition people just to make sure I was the most suitable person for the role. Because I was quite young at the time. I was only 17, and I would be playing a father of two children, which maybe he might have foreseen as being quite difficult for me to do. I think George always had faith in me. I auditioned three or four times, finishing up in America, reading along with actors who were coming in for the part of Madmartigan. And I spent a day in L.A., where various people came through: John Cusack and many respectable actors, including Val Kilmer. I had to read the same scene over and over again, dozens of times through the day. And I finished up at the end of the day with Ron and George saying, "Well done, Warwick, you're going to play Willow." I think they were testing my endurance at that point, to see if I could take it. O: The role seemed to take a lot of physical endurance. WD: Yeah. I mean, it was like nothing I've done before, in many ways. It was the first role I'd done where the audience would see my face. In roles prior to that, I was behind a mask. And all sorts of physical aspects: I had to learn to horse-ride, and I was terrified of horses before Willow. And I'm still not terribly keen… I would never ride for pleasure, only when I'm getting paid to do it. I had to learn to sword-fight, and perhaps most difficult of all, I had to learn parenting skills, basically. I had to learn how to hold the baby correctly, and how to feed a baby, and how to change a diaper. I had a couple of weeks of baby-parenting skills, which was probably the most difficult part for me. O: From an acting standpoint, how did you make the transition from doing mime-like work inside full-body suits to playing a heroic lead? WD: Well, yeah, you need very different styles of acting to do those types of things. In a costume, you need very exaggerated body language—as you say, sort of mime-type skills. But Ron Howard sat with me, and we talked for many hours about this. He was looking for a very natural, very subtle type of performance. He often made references to the films of James Stewart, and made sure Production got me all of his films. I had to watch and study his acting and his style, and that was really the quality that Ron wanted to see in the character of Willow. He's such a fantastic actor's director, because he used to be an actor, so he was the ideal person for that job, for helping me through it, and producing the performance that I did. He was a very key part of that. O: How did George Lucas compare as a director? WD: His style of directing is quite different from Ron Howard's. George will basically… I would see him as a technical director. He knows what he wants as far as the shot goes, and he knows what's going to be added in later. And the kind of thing he would say to me would be, "All right, Warwick, here's where your character meets up with Anakin. Kind of start over here somewhere and then go over and meet him there." And that's what you'll get. Some actors are like, "Whoa!" They need more. But, you know, he's hired me to do my job, and then it's up to me to interpret that into how my character would do it. So he's fairly… I wouldn't say vague, but maybe that was just for me. O: What's your ideal direction style? suited that project. That's the way it's just worked out. Chris Columbus on Harry Potter is great with the children, and brings such great performances from them. It's just a joy to watch how he does it. You'll be off-camera in a scene, for example, and he'll just jump in and stand next to you and do what he needs to do [to provoke a reaction shot from the child actors]. It'll be nothing to do with the scene, and he'll just do it to get that look or that reaction. O: Do you generally get detailed direction when you're playing from inside a costume, or is it all of the stand-here-go-there variety? WD: I've certainly found, with Star Wars and the Ewok movies and such, that you tend to get less direction in that sense. They sort of let you get on with it. When I came up with the character of Wicket for Return Of The Jedi, which was my first film, I was a kid of 11 years old, and I basically was playing a very young Ewok. I was just curious, inquisitive… I did think about my pet dog that I had at the time, because he would look inquisitively at something and tilt his head from side to side, and I used that sort of movement in the character of Wicket. So you get less direction, I would say, than when you're outside of a costume. O: Is it easier playing those roles because there's less to do, or is it harder because you really have to work to bring anything across through a mask? WD: I think both types of roles take different disciplines. I wouldn't say one is easier or more difficult, but when you're inside a costume and a mask, you have to endure heat—and, often, difficulty seeing. The vision is not very good in a mask. And you have to cope with that, as well as trying to think about this character. You have to come up with how this character would walk, how they would move, what their attitude would be if they were standing still. You've got a lot of things to still think, and put across, to make the costume come alive. Although it might cost thousands of dollars and look fantastic, it's nothing until it's moving right. It could go totally wrong. So, things to think about. Whereas if you're on a set and you're not wearing a mask, you're not hiding. It's you, and you've got to be very, very subtle with everything. That is quite difficult. When I go from a role with heavy prosthetic makeup, which I've done quite a bit of as well, and then do a role where I'm not wearing any, I have to be conscious of toning everything down. Because when you're wearing prosthetic makeup, of course, you have to really move your face a lot more to convey things through the makeup. So there are very different disciplines that you have to think about, and a very different feeling on the set, as well, when you're performing. O: Reportedly, the makeup process for the Leprechaun movies took about three hours a day. How do you keep yourself sane during those sessions? WD: Well, I go into kind of a… it's not a meditation, it's kind of a… you have to sit there and relax, because it's not a very pleasant sensation, having someone paint glue on your face and then stick a foam-rubber piece to it. It's not a very pleasant feeling, especially at 4 or 5 o'clock in the morning. Your skin is just not ready for it. I got on very well with that particular makeup artist. We used to have the most bizarre conversations to pass the time. I'm very conscious of sitting very still and letting the artists do their work, because there's nothing worse than having an artist in your chair, if you're a makeup artist, and they're fidgeting around and getting up every five minutes and this sort of thing. I wanted them to be able to do their job to their best ability, because then when I go on set, I feel confident that the makeup looks fantastic, and that helps me play the role all that much better. O: Do you think there's likely to be a sixth Leprechaun movie? WD: I don't know. Everybody would love to see one. I mean, I would say I get five or six e-mails every day from people asking, "Is there going to be a Leprechaun 6?" It's probably the most asked question besides, "Is there going to be a Willow II?" "Are we going to see Leprechaun 6?" I mean, I'm up for it, but the franchise Leprechaun, along with a lot of other films, has been sold. Trimark Pictures, who owned it, sold out to another company called Lions Gate. I don't know what they've got with Leprechaun, and what the popularity is, but I believe there's a campaign going on, with people sending e-mails asking for a Leprechaun 6, so maybe they'll sit up and take notice. O: Where would you like to see the franchise go? What would you like to see the character do in the future? WD: I always saw it going into a TV series. I think that would be great, even if Leprechaun just introduced some kind of weird tale. I always thought that's what would happen. It would mean me being in the makeup less. [Laughs.] Because that is the thing about it, you know. I would love to see it go on, but then I'm asking for it. I'm asking for long night shoots, because these films always take place at night, and getting back into that makeup again. I always have to cross a psychological barrier every time I do a film like Leprechaun. It's an initial, "Oh, God, I've signed on the dotted line, and that means four weeks in this makeup again." But I love the humor elements of Leprechaun. That's the bit that I enjoy the most about playing the role. So, let's go, more humor. O: In a lot of your interviews, you talk about the advice you've given to filmmakers—scenes and lines you've suggested, characters you've come up with that you could play in the future. How involved do you generally get in shaping the movies you work in? more than others, of course. With the Leprechaun movies, because I've done so many of them, I tend to have more input in what the character does and says, and that sort of thing. But things such as Harry Potter, all I can do is shape my character, seek the director's approval on that, and basically take it from there. Professor Flitwick in Harry Potter, I kind of defined how I saw him from reading the book, and luckily that matched up with the director's vision. That's why he gave me the role. And I was able to go from there. It depends. O: You've been in a lot of fantasy and science-fiction movies. Are you a fan of the genres yourself? WD: Oh, yeah. I mean, it's great to escape, isn't it? There's nothing better than going to the movies and going into another world, and forgetting about everything that's happening outside. If I had a list of movies to choose from, I would probably pick the one that is a fantasy or sci-fi film. Many of my roles have been in those films, and quite often people say to me, "Aren't you sick of doing those? Don't you want to do something average and everyday, where you're kind of an everyday character?" And I say, "Yes, I would like to do that, but at the same time, I'm an actor. And to come up with a character that nobody knows anything about, that doesn't actually exist, is quite a challenge in itself. Because you can define this character, and you can come up with all these strange things he might do. It's another job to me. I'm not one of these actors who's, "I'm sick of these fantasy roles! I'm campaigning to be in a soap opera!" If I'm working, then that's fantastic, whatever it might be. O: What's your dream role? WD: I would like to play an average guy. I would have loved to play opposite John Candy in a movie. That was my dream for a long time, and sadly, now I can never realize that. But I'd like to do comedy. I very much enjoy comedy, especially the style that John Candy used to play in. I've written a treatment, an idea, for something called Spymaster, which I've been throwing about for years. Myself and David Steinberg, who was in Willow—he played Meegosh—we came up with this idea while we were doing Willow, because we both said, "Wouldn't it be great if we could just do something where we didn't have to have all these wigs and weird costumes, where we could just wear jeans and T-shirts?" So we came up with this idea. And I've been putting it about to people in the business for the longest time, and just last week, some sort of interest has started to emerge from America, and also in this country. It remains to be seen whether that interest is going to be something that will develop into a series. We'll see. O: How did Willow Personal Management come about, originally? WD: It was really through a need for something like it. There was an agent over here—as there is, probably, in every country—who basically represented a lot of short people. And I saw him more as a booker, really. He didn't represent me, but he represented my father-in-law, Peter Burroughs. And we were talking one day, me and Peter, and we said, "You know, there is a better way of doing this. If everybody stuck together, we could get better rates for them, better money and better conditions when they're working." We felt that short people should be treated just like any other actor in a production, and not as sort of an accessory. We thought they deserved much more recognition. So we said, "Nobody else is going to do it, and we can see this from a different perspective. Why don't we just do it?" And it was one of those things that we just did. We came up with the name "Willow" because we felt that it had very positive connotations for short people, in the fact that the film was groundbreaking in itself. I don't know if it was the largest gathering of short people on a film or the second-largest, but it was a very positive film for short people. It shows them in a very positive light. A heroic character being small is very unusual. Billy Barty would comment on that when we were filming. He said, "This is fabulous. I've been in the business for so many years, and this hasn't happened. And it's about time that it did." And he was thrilled that it was. So, yeah, we took the name Willow—I checked with George, and he thought it was fantastic—and we've been running now for six years, and we've been very successful putting people in theater, films, commercials, and so forth. O: You've said that the company screens out roles you feel are inappropriate for short actors. WD: We try to, yeah. O: How do you define an inappropriate role? What sort of things do you screen out? what kind of short actor do you need?" We wouldn't use the term. I don't mind the term "dwarf," but when we're speaking to somebody, we say "short actor," and it immediately raises the stakes a little bit. It's a different level that you're speaking on at that point. O: Do you still find a lot of prejudice when you're dealing with directors, casting directors, and so forth? WD: Not really. Casting directors, we don't have any problems with them. I think in general, life has become less prejudiced to anybody who's different. When I was growing up, I used to notice a lot more people staring, and that kind of thing. But nowadays, I think everybody's more politically correct, and they're aware that there are people who are different, and have disabilities, and that kind of thing. I think that the media, communications and television and the Internet and that kind of thing, have really spread the word that we're made up of many shapes and sizes in society, and that it's the norm, really. I don't notice anybody staring at me anymore—I mean, unless they recognize me from being in film. O: You've mentioned in some interviews that you're disappointed with the way the new Lord Of The Rings movies were cast, with tall actors who will be digitally shrunk to look like hobbits. WD: It's a shame. It is a shame, a little bit. I mean, I auditioned for one of the roles, and so did some other clients from Willow Management, and the thing is… It's a very valid point, that they decided there weren't enough short actors to fulfill all the roles they had with the ability that they needed. So, therefore, they had to use tall actors and shrink them. O: Do you think the growth of CGI technology is going to limit the roles for short actors in the future? WD: Well, it's certainly something I've thought about. Because CG is getting so wonderful, if you've seen Shrek, recently. I mean, there are many things in that film that worry me, how good it's getting. But there is a certain something about an actor in a costume onscreen. You can get a certain indefinable something from that person being there. If you stood me in a costume next to a computer graphic of the same-looking character, I think there would be a difference. And many movie fans I've spoken to would rather see an actor in a costume than CG. For certain things. CG suits certain characters more than others. With Harry Potter, for example, I felt that film went back to a much more traditional way of making movies. All of the sets were there, all of the characters were there, where possible. They even opted, sometimes… They were considering CG for some of the characters, but decided to use short actors in costumes. And there were other actors in costumes, which I thought was great. And it gives that movie a certain essence, a certain kind of realism. I really can't describe it, but there's something about it that's more real.